No need for a 25' ladder when you can walk onto your rooftop! A-cero, is a Spanish based architecture firm who is widely known for turning sculptural concepts into architecture. A beautiful representation of their reputation is seen in a recently complete project called the Concrete House II. The house is located directly outside Madrid on a large plot of lush land. 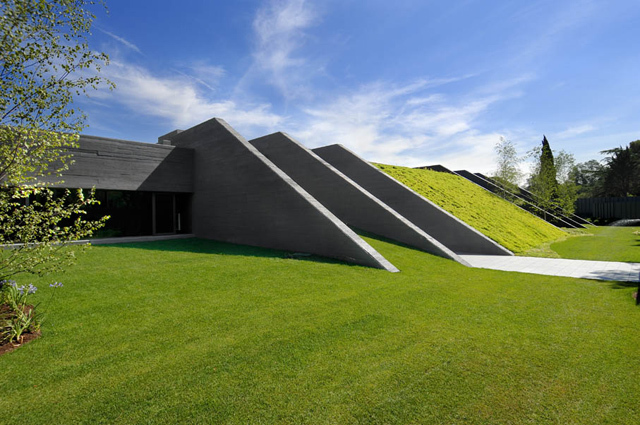 A-Cero did a beautiful job of incorporating nature into the concrete home by allowing the grass to climb up the ramps of the house and onto the rooftop. The exterior angles of the home appear as though they are escaping from the ground and reaching up towards the sky!! The home is a stunning sight in the evening, where it is well lit...like a proper sculpture would be. A-Cero chose warm greys, wood, stone, and creamy textures to gussy up the interiors. In areas meant for preparation and cleanliness, such as the kitchen and restrooms, the design is streamlined, modern, stark; using materials like Corian, Laminate, and glossed floors. On the contrary, areas meant for lounging and relaxing are quite warm and comfortable with plush textures and dark art work. Large artwork graces the walls with internally lit console tables to add unobtrusive accent lighting. The rear of the house is mostly all glass windows, in this case, the repeating exterior walls come in handy as they provide privacy and keep the home cooled down. Underneath the house is a stealth looking black parking garage with recessed blue lighting which dictates parking spaces! !